How to raise chickens for eggs when you don’t know too much on the subject? It’s easier than you think. Raising your own chickens for eggs can be an incredibly rewarding experience. Not only will you benefit from being close to the source of your food, but you will also have the health benefits of a more natural diet. In the article below, you will learn about the necessary steps you should take to start raising your first chickens, how you should care for them, what and what not to feed them and when you can expect for them to start laying their first eggs. What Are the Benefits of Learning How to Raise Chickens for Eggs? Learning about how to raise chickens for eggs will provide your family with a source of healthy, natural, antibiotic-free protein and fat straight from your garden. Combined with your organic garden, you will be eating in a sustainable, healthier way. If you choose to raise your hens the free-range way, they will lay eggs with a better nutrition profile. They will have less cholesterol and saturated fat, twice as much onega-3 fatty acid, 3 times as much vitamin E and a whopping 7 times more beta carotene. First, find out if it’s legal to raise chickens in your area. Even rural communities may have rules against raising chickens in a residential area. It’s best to check with your neighbors too, even if it is allowed in your zone. Chickens make noise, even if you don’t have roosters. It’s best to be considerate and let your neighbors know what you’re are doing, especially if your houses are close together. Next, buy or build your coop. Chickens need a warm, safe place to sleep and lay their eggs. If there are cats in your neighborhood (and there usually are), it will need to be very secure and protected. This isn’t just to protect your chickens, it’s to protect the cats too. Your neighbor may become upset if their cat returns with a few pecks missing from their fur or worse. Make sure your coop design has plenty of light and air circulation. Consider fencing their grazing area with a “run” to provide extra protection if this could become a problem. For extra gardening benefit, consider chicken tractors, which are a kind of portable run that you can move throughout your yard. The chickens will eat pest bugs in your garden and improve the soil while they benefit from fresh forage and a healthy, natural diet. Whichever type of coop and run you choose, plan for 3 to 4 square feet per chicken inside the coop and at least ten square feet of space for each chicken in the run. Most important, make sure you have a good waterer in the run. Provide temperature control for babies. This is one of the first mistakes a novice can make when learning how to raise chickens for eggs. If you purchase or hatch young chicks, they will have trouble keeping their body temperature stable while they are young. You will need to provide a heat lamp and a warm nesting place that remains at a consistent 95 degrees Fahrenheit. You should wean the chickens off the heat lamp gradually over the course of a few weeks until your chickens are comfortable at normal ambient temperatures. After they are two months old, they will be ready to live independently in their coops. Teach them how to drink from their waterer. While you are learning how to raise chickens for eggs, baby chicks are learning how to drink. You can tell if they are thirsty because they open their mouths and pant. When you see this sign, just dip their little beaks in a small amount of water to help them along. They will learn how to use their waterer, but help them along to start. Give them the right food. 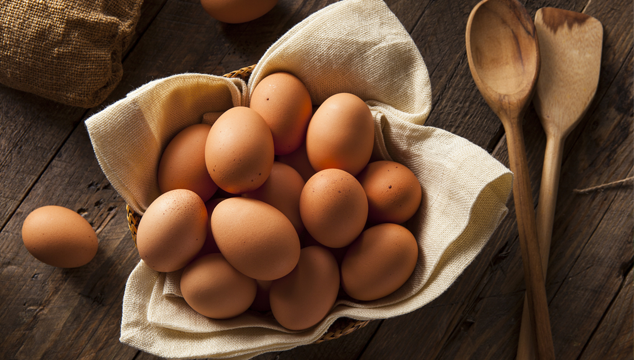 Choose a variety of foods for your chickens for the best eggs. They love food scraps, garden insects, grass, greens, corn and night crawlers. Never feed your chickens earthworms. They will dig some up and eat them on their own, but earthworms can cause a sickness called gapeworm, so it’s best to keep it at a minimum. Also, never feed chickens citrus fruit, candy or sugary sweets, chocolate, salty foods, foods with caffeine, avocados, onions, dairy or anything that’s moldy. Be sure to supplement their diet with cracked corn in the winter as this will give them the energy they need to maintain their temperature. Make sure that they have sand. Chickens need sand to digest their food. For older hens, you can simply mix a little sand with their scraps. For younger chicks, consider buying chicken crumbles that are properly formulated with sand for their health. It’s Time to Lay Eggs! Teach them where to lay eggs. If you start with babies, you will have a wait while you learn how to raise chickens for eggs. Chickens start laying eggs at about 6 months on average. More or less depending on the breed. If there are no other hens to teach your chickens how and where to lay their eggs, place a fake egg (not a real egg, they might eat it) in their nesting box to give them a hint. Collect the eggs. Once they start laying, you have successfully mastered the art of how to raise chickens for eggs. Collect the eggs every day to free up their nest. Wipe them with a clean cloth to remove goop, while leaving the protective bloom. This is nature’s way of keeping the egg fresher for longer. If the eggs have feces on them, clean them with a mixture of ¼ ounce of bleach to ½ gallon of water to remove possible salmonella contamination. Then store them in the refrigerator. Before you use the eggs for cooking, be sure to give them a good wash to remove any remaining bacteria and prevent contamination of your food. Generally, chickens will productively lay eggs for 5 to seven years, depending on their breed. Most live between 8 to ten years and will still lay some eggs for most of their lives. Laying hens tend to become part of the family, like a pet, and so be prepared to become attached as you learn how to raise chickens for eggs. They are very smart and each has its own unique personality. Even after they have stopped producing eggs on a regular basis, they will still benefit your garden by eating pest insects and working and fertilizing your soil. Do you have helpful tips to add? Please comment below! Hey Buddy!, I found this information for you: "How to Raise Chickens for Eggs – A Beginner’s Guide". Here is the website link: https://backtofarm.com/how-to-raise-chickens-for-eggs/. Thank you.